The pick is the Seahawks’ first selection in the opening round since 2012, when they took linebacker Bruce Irvin. Indeed, on paper it was a win-win for the Seahawks. They filled an obvious need by picking Texas A&M offensive lineman Germain Ifedi and indulged in their favorite draft strategy — moving down to acquire more picks. The 6-foot-5¾, 324-pound Ifedi was a three-year starter as a right guard and right tackle in college and is expected to compete with free-agent signee J’Marcus Webb at right tackle. Personal: His brother, Martin Ifedi, was drafted in the seventh round by the Rams last year and is a defensive end with the Tampa Bay Bucs. Germain Ifedi was a highly recruited offensive lineman out of Houston and decided to stay close to home when he chose Texas A&M. He passed up his final season at Texas A&M to enter the NFL draft early. His father works for United Airlines, and his mother is a parole officer and part-time nurse. Scouting report: The Seahawks filled their consensus need and their most obvious hole by drafting an offensive lineman in the first round. Ifedi has a versatile background, which the Seahawks like from their offensive linemen. He started as a guard in college before spending his final two seasons at tackle. 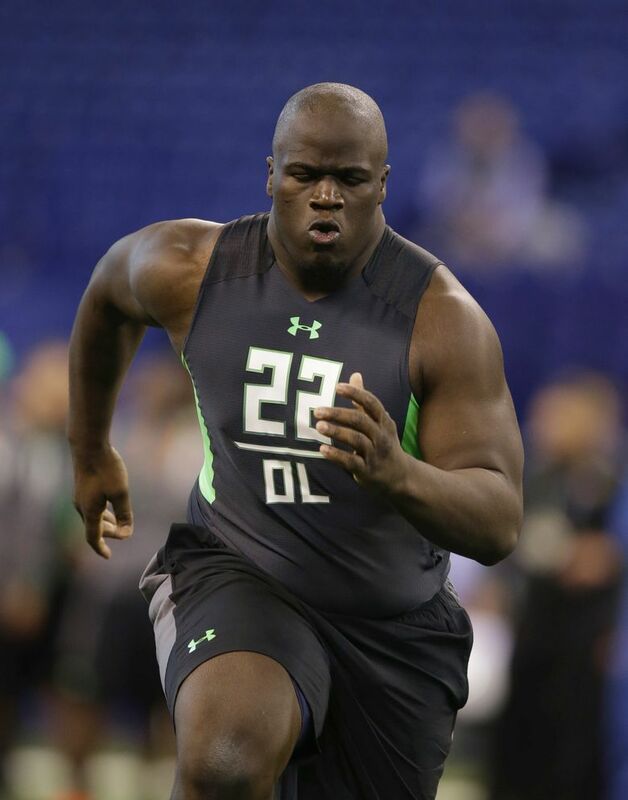 Another thing the Seahawks like: Ifedi is a good athlete for a big guy and moves well along the line. That’s important for linemen who play for offensive-line coach Tom Cable. Ifedi is a bit raw and didn’t operate out of the three-point stance much in college, but many analysts think he has a big upside. “He’s a really good pick for a team that needs offensive linemen,” NFL Network analyst Mike Mayock said during its draft broadcast. The Seahawks took Ifedi with the 31st pick in the first round after trading the 26th pick to Denver, which wanted to move up to take quarterback Paxton Lynch. They received the 94th pick in the third round for moving down five spots, giving them 10 picks in this draft, including five in the first 97 selections. Schneider said Thursday night that the Seahawks considered trading down again to move out of the first round, adding, “It got close a couple of times.’’ But ultimately they kept the 31st pick and made their first selection in the opening round since 2012, when they took Bruce Irvin at No. 15. The Seahawks also saved money. Lynch, as the 26th pick, will be paid almost $9.5 million over the four years in the NFL’s slotted system for rookie contracts, and Ifedi will receive $8.265 million. By adding Ifedi, the Seahawks took a significant step to address perhaps their most significant draft need, shoring up an offensive line that took a while to coalesce last season. They also must replace departed starters J.R. Sweezy and Russell Okung. Besides adding Webb and Ifedi, Seattle signed veteran Bradley Sowell, who is expected to compete with Garry Gilliam at left tackle. 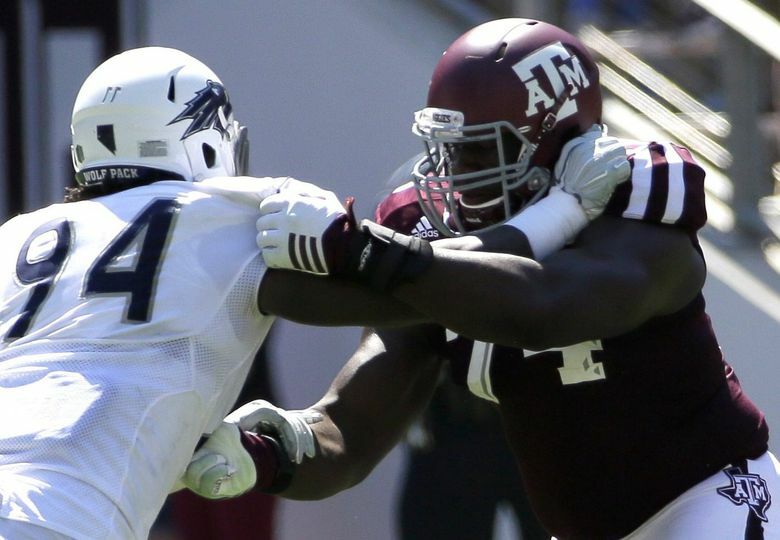 Ifedi, a native of Houston, redshirted at Texas A&M in 2012 when current Seattle center Patrick Lewis was in his final season with the Aggies. Ifedi played right guard in 2013 and right tackle his final two seasons. Cable said he began to get excited about Ifedi while watching film and grew more so when he worked Ifedi out during Texas A&M’s pro day. Ifedi also has the kind of measurables Seattle has often favored, notably 36-inch arms. “You’re talking about a big, big powerful guy with a lot of length,’’ Cable said. Ifedi played mostly in a two-point stance in A&M’s spread offense, and Seattle’s coaches have lamented that players who come out of such schemes sometimes need a while to adjust. Coach Pete Carroll said he also thinks Ifedi can make a quick adjustment in part because he has the kind of temperament that fits Seattle’s style. Several mock drafts had Ifedi pegged for the Seahawks, based on his measurables and their need. Asked if the Seahawks would have taken him at No. 26, Carroll and Schneid­er declined to answer. Schneider, though, noted that the Laremy Tunsil situation — a possible top-three pick, Tunsil fell to 13 after a video of him smoking marijuana surfaced — meant “the tackles lasted a little bit longer,’’ which he said “was beneficial’’ for the Seahawks. The Seahawks figure to take a few more of each in the final six rounds, which begins for them in the second roundwith the 56th overall pick. The Seahawks then have three more in the third round Friday, giving them five of the top 97 picks. The Seahawks haven’t had that many in the first 97 since 1977, when they traded the No. 2 overall pick to Dallas, which then took Hall of Fame running back Tony Dorsett. Asked about the prospect of making that many picks in the final two days, Schneider smiled. “It’s going to be a blast,’’ he said.